Chopin in Paris introduces the most important musical and literary figures of Fryderyk Chopin's day in a glittering story of the Romantic era. During Chopin's eighteen years in Paris, lasting nearly half his short life, he shone at the center of the immensely talented artists who were defining their time -- Hugo, Balzac, Stendhal, Delacroix, Liszt, Berlioz, and, of course, George Sand, a rebel feminist writer who became Chopin's lover and protector. Tad Szulc, the author of Fidel and Pope John Paul II, approaches his subject with imagination and insight, drawing extensively on diaries, memoirs, correspondence, and the composer's own journal, portions of which appear here for the first time in English. He uses contemporary sources to chronicle Chopin's meteoric rise in his native Poland, an ascent that had brought him to play before the reigning Russian grand duke at the age of eight. He left his homeland when he was eighteen, just before Warsaw's patriotic uprising was crushed by the tsar's armies. Carrying the memories of Poland and its folk music that would later surface in his polonaises and mazurkas, Chopin traveled to Vienna. There he established his reputation in the most demanding city of Europe. But Chopin soon left for Paris, where his extraordinary creative powers would come to fruition amid the revolutions roiling much of Europe. He quickly gained fame and a circle of powerful friends and acquaintances ranging from Rothschild, the banker, to Karl Marx. Distinguished by his fastidious dress and the wracking cough that would cut short his life, Chopin spent his days composing and giving piano lessons to a select group of students. His evenings were spent at the keyboard, playing for his friends. It was at one of these Chopin gatherings that he met George Sand, nine years his senior. Through their long and often stormy relationship, Chopin enjoyed his richest creative period. As she wrote dozens of novels, he composed furiously -- both were compulsive creators. After their affair unraveled, Chopin became the protégé of Jane Stirling, a wealthy Scotswoman, who paraded him in his final year across England and Scotland to play for the aristocracy and even Queen Victoria. In 1849, at the age of thirty-nine, Chopin succumbed to the tuberculosis that had plagued him from childhood. 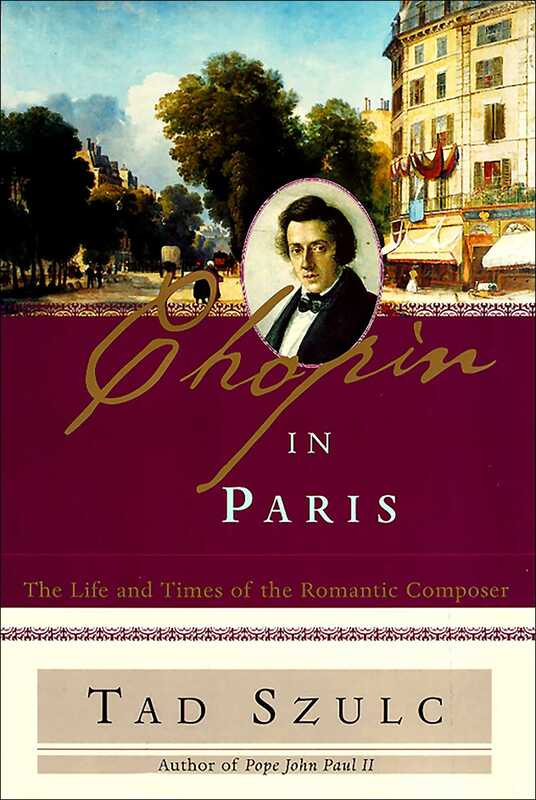 Chopin in Paris is an illuminating biography of a tragic figure who was one of the most important composers of all time. Szulc brings to life the complex, contradictory genius whose works will live forever. It is compelling reading about an exciting epoch of European history, culture, and music -- and about one of the great love dramas of the nineteenth century.